No one has come out of this without poo on their faces. The Commission have actively made things as difficult as possible for the U.K. exploiting weaknesses in the U.K. leadership as well as shamelessly using things like the good Friday agreement as bargaining chips, couple that with the attitude of Tusk highlighted by his ridiculous comments, the EU should be ashamed of their role in Brexit. And clearly the issue has widened the division between parties, but also created rifts within parties. What should have happened is, upon receiving the outcome of the referendum formal views should have been made and then everyone should worked together to make Brexit as successful as possible. Instead, what ensued was an almighty tug of war no one was winning. Madness. well look at it this way, divorce has never been an easy, amicable and definitely not this one. expectations from the British side were exceedingly high and the EU took it personally. not the kind of environment where anything could be resolved amicably. i just want to touch on a overlooked fact. the majority of the British fight has come from a minority few that has rubbished the EU in order to pick a fight and win the day with the simple mantra of victory at all cost. that being Farage, the European Research group and the DUP. these are the groups that have led the fight and looking at it from the EU point of view the ones most to win politically from any further compromise, especially on the Irish backstop. they have effectively blackmailed the rest of the country and bullied May into doing whats good for their thesis and not the UK. 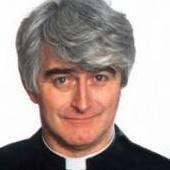 now let me ask you... if you were the EU would you re-negociate the withdrawal agreement and the Irish backstop to reward the instigators of Brexit? i wouldn't and that more than likely is the reason why Tusk said what he did. under these conditions its hard for parties and the electorates to have any working faith among themselves when such singular selfishness is on display. like a civil war. the tug of war you suggest has divided the country not united so i can't see how brexit can be good. one has to ask how much of a cost will brexit force on the UK or even if there will be a UK in the same form in 10 years form now. N.I. has 2 choices , stay with Britain or stay with the E.U. if they decide to stay with the E.U. they will have 1/27 th say in their future . As far as saying that your gov't is a joke , well so is ours , but I still don't want to be ruled by E.U. semi Nazis who are worse than both our gov'ts. i think Ireland is the most dependent and integrated country trading with the UK. it will be interesting to see just what the EU will do to support Ireland ahead of a major disruption in British trade. In one labour constituancy the M.P. decided to vote remain while it was proven that 71% of her ward voted to leave, so she deliberately went against her voters wishes ,and democracy . We have a representative democracy, not absolute. Therefore she may have gone against her voters' wishes but not against democracy. Our representatives are entrusted to make decisions on our behalf because they have the expert advice we do not. That's the theory at least but we just keep voting for the nice soundbites instead of the expertise. Apparently they have already agreed assistance if it's required. N.I. has 2 choices , stay with Britain or stay with the E.U. it would seem they have another choice too... have a referendum for a united Ireland. What if Sinn Fein become the lead party in Northern Ireland and call for a referendum on Irish unity and reintegration into the European Union? If the UK leaves will the EU keep the door open just in case they want to rejoin? If Northern Ireland goes, then Scotland would surely follow, and England and Wales might find their future unsustainable, so in order to keep the United Kingdom together it might be better to just call quits on the whole idea of Brexit. Going through with it is certainly a big gamble. I think many MPs are asking themselves "why take the risk? If one of us were in parliament would we take that risk, especially if our constituency voted to remain. ...why wouldn't Sinn Fein call for a referendum? isn't that what Brexit was all about. taking back control. does it really make a difference if its leaving the EU or the UK as long as its the peoples will. Can Britain afford to keep Northern Ireland? 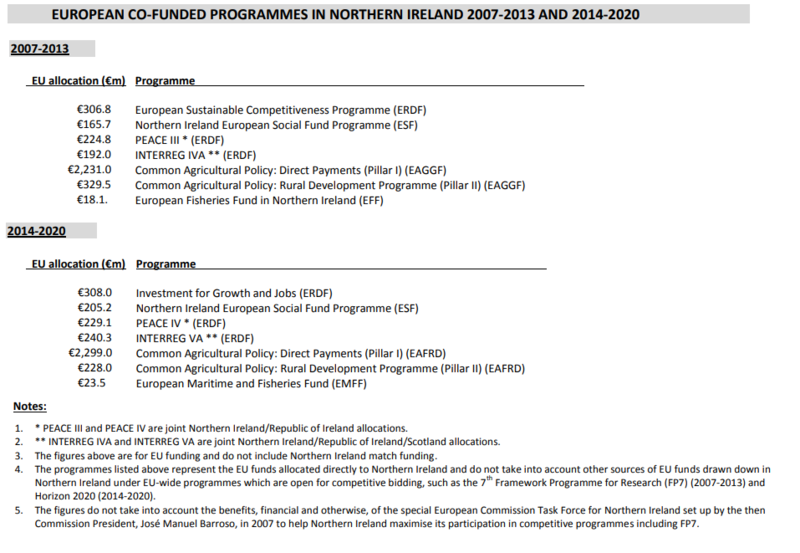 List of EU money sent to Northern Ireland. Will the Bank of England have to foot the bill for many of these programmes, or will they just scrub everything out and start fresh? Meh... 3 Billion Euro's every six years.. or 500,000 Euro's per year ? How about the 2-3 billion of EU funding for scientific research? When we leave the EU then we are in unknown territory when it comes to knowing how the external environment will change. It is simply too complex for any business to accurately predict. After we have left and things settle down then they can ascertain how they need to adjust. For now their scenario planning needs to buffer them against realistically possible levels of disruption. I would say that customers are unlikely to hold a grudge against any delays because they realise its not the fault of the business. They will later on against those firms which are slow to adapt. At the end of the day organisations have had 2 years to prepare and get their affairs in order to handle any disruption while the dust settles. And I dont see it as being unreasonable to expect them to have disruption scenarios planned out. Environments constantly change, businesses need to change with them. Some firms wont be able too because they lack the resources, some firms will need to reinvent themselves as it no longer become tenable to offer their existing products and services. Thats the nature of business and new organisations will replace those ones we lose which are suited to trading in the new environment. Some will also refuse to change. The UK high-street is full of organisations which refuse to change - HMV, Debenhams, Game, M&S, are some. Some that already went bust because of it are BHS, Comet, and Woolworths. With them they either refused to move most of their business online or failed to adapt to changing consumer trends. With most of them its a leadership failure caused by having directors which think they are always right so they dont listen to other views. As a result flexibility and adaptability is non-existent in them. Brexit will catch some out too. There will be naïve business owners who even right now have set their firms up in such a way that they assume we will remain in the EU. No scenario planning will have occurred. Firms need to plan for remain, Soft leave, Hard leave, and extension of Article 50, so they are covered whatever happens. After things settle down we will do better than what we have been doing in the EU as policy will more closely match the needs of just our businesses not the ones across the whole of the EU. And the lifting of austerity will prevent any recessions and in my opinion will cause a boom. Bear in mind that only about 8%-11% of UK companies actually export to the EU. Over what time period ? If that figure is annual, then do bear in mind that 1 Billion Euro's of that 2-3 Billion is the UK's contribution to the EU research program. So we're only actually 1-2 Billion out of pocket. The total Government spend on research (excluding the European contribution) was about 12 Billion last year. In addition, the UK gets to CHOOSE what to spend that money on, whereas the EU funding is based on decisions made in Brussels, which may or may not benefit the UK. So I'm not unduly concerned at this stage. This is the same country which builds £1Bn Warships. our contributions to the EU £19.2BN Gross £12Bn Net. not counting the £7Bn tariffs/VAT collected by the UK on behalf of the EU. lets be honest the UK, this small, insignificant Island. who also just happens to be the EU's second largest Net contributor. can afford whatever we choose. this is the same country who gives away £13Bn in foreign aid. Worst comes to worst. £40Bn. cash on the hip to spend here at home. in fact our EU contributions alone if taken over 15 years. apply tax multiplier, money spent, taxes raised on it. guess what £1.2Trillion. Arklow Shipping, a major Irish shipping firm, withdrew its support from Seaborne "without warning". as a result the contract as been cancelled. The Department of Transport said it made the decision after the company's Irish backer pulled out. No taxpayer money has been transferred to Seaborne. The government said its confidence in the viability of the deal with Seaborne was based on Arklow Shipping's backing of the company and the assurances it received from them. I hope that March 30th will see a decrease in Corporation Tax to 10% (undercutting Eire's 13%) which will have a massive positive effect on Inward Foreign Investment and completely negate any hiked Tariffs imposed by the EU Commission. A reduction in Income Tax to 20% which will be an enormous boost to spending in the UK (Tax Income neutral to the UK) and preserve any potential job losses. Massive investment in Team UK Technology Parks and Centres of Excellence for research funded through shared IP, and even greater Entrepreneur funding. The futures exciting we can build a country for everyone. A general election will be required first if Farage is going to be an any position to contest the extension. By the time a General Election occurs either it will have already been extended (in which case Farage has already failed) or Brexit will have been completed/abandoned, in which case he doesn't need to contest the extension...so at best his position on extension to article 50 is irrelevant. I consider it highly likely that brexit is simply the prelude to the breakup of the UK. NI will join RoIreland, Scotland will go, and probably build a wall..
Tax rate adjustments should be made based on and only based on the level of demand in the UK economy. When we boom taxes need to go up, when we are doing badly they need to come down. I predict Brexit wont be bad for the economy so when austerity gets lifted we will get a massive boom. Taxes will need to go up to prevent high inflation. Look at it as a NEW Party in response to events. just as UKIP spawned out of Maastricht and our potential membership of the Euro. Nigel Farage as UKIP leader took votes from the Tories and Labour he had the two parties panicking. he also led UKIP to a National victory and i stress the word national victory in the European Elections. The Brexit Party will go "live" if there is an extension to Art.50 that means the UK will also have to hold elections to the EU Parliament. This is not about fighting a GE at all. Nigel Farage will keep his powder dry unless that scenario becomes a reality and I suspect that there will be a near clean sweep for the new party. UKIP was the only party representing the majority of Leavers but they have lost that loyalty due to some truly stupid internecine rivalry and appointments. Fiscal policy is used to control demand and part of that is tax rate increases or rises. While it might seem counter-intuitive to you, you dont reduce taxes during good times. You increase them to cool down the boom. The Evidence is damning. Ministers in DexEU giving this evidence to the committee. yet Where is the BBC? Why is it not highlighted on the 10 O'Clock News? we all know why. the bias. Since the Brexit vote the BBC has lost 3.5Million people who've cancelled their TV licence. 865,493 in 2018. no wonder the BBC cancel free TV licence for over 75's, and increasing the licence by £4. people are turning off because the BBC no longer reflects peoples outlook on life. Anyway 47 days till the EU has to compete on the global stage for our business. there's a £100Billion surplus up for grabs im sure the world market is licking its lips. the EU is losing its treasure island. The BBC dosen't even try to hide it's bias anymore. and that's why its losing licence fee payers, and more people are switching to Netflix, Amazon Prime, and other streamable media, people are fed up with the BBCs outlook and PC driven crap contained within its output. - just look at Cbeeies that's the age the BBC starts its brainwashing. Just look at Brexit its blew the lid.